A Haitian lawmaker has been arrested after police spotted his name on a list of inmates who escaped on the day of the island’s deadly earthquake last year. Police say Deputy Arnel Belizaire was taken into custody Thursday after he arrived in the capital, Port-Au-Prince, on a flight from France. He was then transported to the National Penitentiary where his supporters gathered, calling for his release. 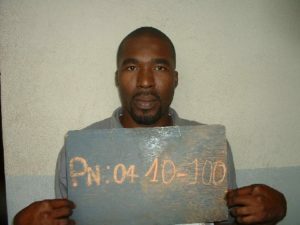 Belzaire had been in the same prison in 2005 for an illegal weapons charge before he escaped and was recaptured the same year. He spent the next five years in the National Penitentiary before escaping during last year’s earthquake. Belizaire was elected to the Haitian Parliament in a March run off election this year as a member of the Veye Yo party. Haitian officials have not given any details on the next legal step following Belizaire’s arrest. Haaaa papa “Veye yo”. lol pun intended. It wasn’t just an illegal weapon. This man is a murderer. How many other convicts are in our Chambre and Senate?